This flag is part of the effort to achieve recognition and equity by the modern-day descendants of Pacific Islanders transported to Australia in the 19th century as coolie labour, chiefly in sugarcane and timber-getting industries in Queensland and north coast New South Wales. The ASSI flag was first designed in 1994 by Tony Burton, of Flags Australia, in consultation with the executive of Australian South Sea Islanders United Council (ASSIUC). There was a recognised need for a simple flag that would stand with distinction alongside other flags and represent this distinct community. That was no small consideration at a time when the condition of the Australian South Sea Islanders was beginning to attract international attention - the ASSIUC President having addressed the UN Special Committee on the Rights of Indigenous Peoples in Geneva in 1994 - and finally in August 1994, belated recognition by the Commonwealth Government. The flag was formally adopted in 1998 by ASSIUC. 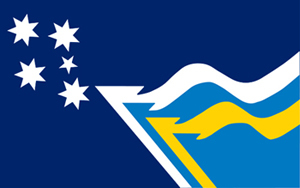 Initially, the flag was presented in the proportions 3x5, however it is now made in the proprtions 1x2 as most flags in Australia are made longer so as to be the same size as the Australian national flag when displayed with it. The flag is unique in design, incorporating colours resonant to people with forebears from the Solomons (blue, white, green and gold) and Vanuatu (green, gold and black), as well as some other parts of the South Pacific (blue and white). The BLACK column next to the flag pole - the most important part of any flag - is for the people standing strong in community and surviving despite the hardships and injustices of the past. The horizontal BLACK band stands for our continuing in the future. BRIGHT BLUE recalls our origins from the South Pacific, the sea and the sky. BRILLIANT GREEN is for the land and especially islander peoples' contribution to agriculture (including sugar cane) and to the development of our home, Australia. It also stands for our hope for the future and for our children. Deep GOLD stands for the sunshine and the sand of our original island homes and that of our homeland now, Australia. The SOUTHERN CROSS reminds us of our home in the South Pacific, and as it is the badge that Australians associate with, it emphasises that we are also Australians. The flag has seen formal outings - at the dedication of the ASSI Pioneers memorial at Chinderah in northern NSW, and in response to requests from ASSI people. Most of the original labourers were recruited from the Solomon Islands and New Hebrides (Vanuatu), though others were taken from the Loyalty Islands, Samoa, Kiribati and Tuvalu. Some were kidnapped (“blackbirded”) or otherwise induced into long-term indentured service. The map below shows the traffic routes used in the South Pacific from 1863 to 1902, from "The Blackbirders" by Edward Docker. Reflecting European prejudices of the time, the men were generally referred to as “Kanakas” (boys). Islander descendants regard this term as a pejorative and insulting reminder of their ancestors' exploitation at the hands of white planters and their recruiters. The exact number of Islanders who were "blackbirded" is unknown and still controversial. The extent to which Islanders were recruited legally, persuaded, deceived, coerced or forced to leave their native lands and homes for Queensland is difficult to determine. Official documents and accounts of the time are often at odds with the family histories passed to descendants. Accounts of blatant and forcible abduction by deceit in the main relate to the first years of the trade, which led to the formal system of legal indenture. The port city of Townsville is named for Robert Towns, who began the importation of low-paid Islander labour into Queensland, a practice copied by other traders and that involved widespread abuse of the Islanders. Of the more than 60,000 Islanders recruited from 1863, the majority were to be "repatriated" (that is, deported) by the Australian Government between 1906-08 under the Pacific Island Labourers Act 1901, legislation prompted by the White Australia Policy. Some were exempted on various grounds, including marriage to Australians. These and others who escaped deportation remained in Australia and their descendants today form Australia's largest Melano-Polynesian ethnic group. 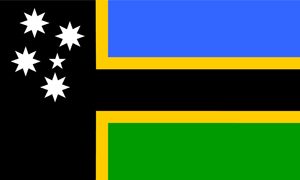 Many Australian South Sea Islanders are also of mixed ancestry, including Aboriginal and Torres Strait Islander people for whom thay are often mistaken. In consequence, Australian South Sea Islanders have faced similar forms of discrimination meted out to Aborigines and Torres Strait Islanders. Many, including Faith Bandler, Evelyn Scott, Bonita Mabo (widow of Eddie Mabo) have been prominent in civil rights and politics. Australian South Sea Islanders have also excelled in sport: Mal Meninga, Sam Backo, Gorden Tallis and Wendell Sailor are household names to fans of rugby. 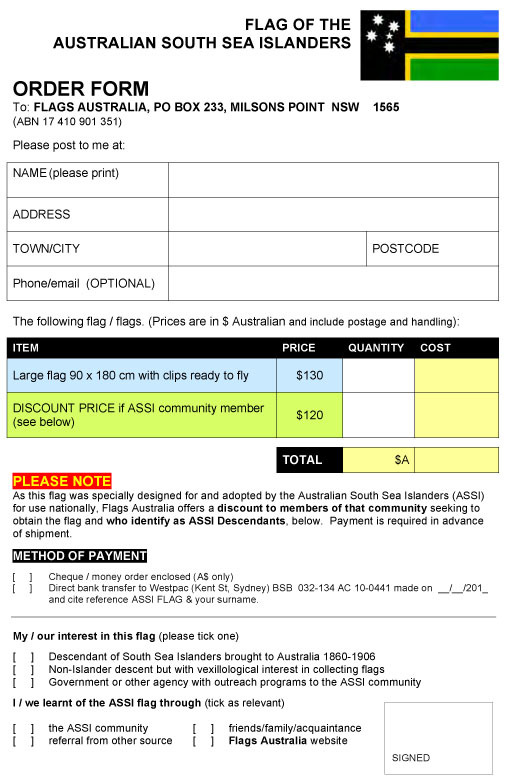 A supply of the ASSI flag is available for sale through Flags Australia. A small discount is available to members of the ASSI community who identify themselves as ASSI Descendants. The order form is set out below and it is also available as a PDF download (click here).